Pioneer Works is pleased to present Chrysalis, a live interactive environment and the most recent of a series of Inflatable Architectures by Brooklyn-based artist Chico MacMurtrie of Amorphic Robot Works. 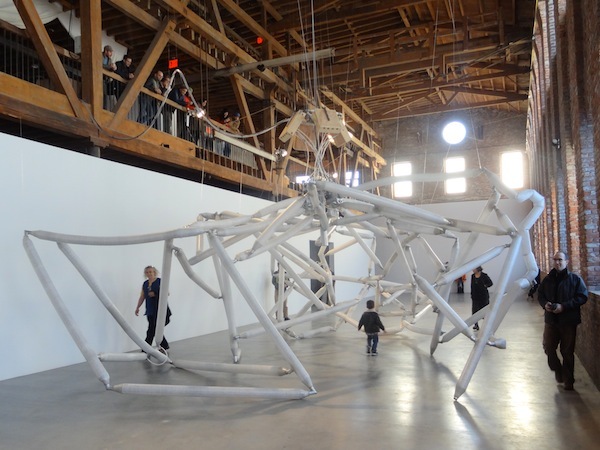 The exhibition features 100 interconnecting high tensile fabric tubes that form, when fully inflated, 40-foot-long, 26-foot-wide, and 16-foot-high space, evocative of a molecular architecture. A servo controlled computer system regulates the flow of air that initiates the tubes’ expanding, retracting, lifting, and lowering movements. Inspired by the architecture of the human body on a molecular level, Chrysalis resonates with audiences of different levels. As a visitor is approaching, Chrysalis responds by opening one or a combination of several sections or by creating a portal that invites a visitor inside. Chrysalis functions also as a temporary architecture that performs independently from audience interaction by drawing from previously recorded software sequences. In its transition from an organic to a geometric state, Chrysalis can ultimately be appreciated from the inside of the sculpture. The magnitude of the sculpture in relation to the size of the human body engages the audience in a transformative experience as they face and interact with their own biology on an inverted scale. Chrysalis, with its ever-changing geometry, is a manifestation of the hidden organic life that inspires and informs all manmade systems. Throughout the month of October, Chico MacMurtrie and his collaborator Bill Bowen create a new language for Chrysalis in response to the dynamics of the space at Pioneer Works. The Forest of Totempoles is an interactive installation consisting of five inflatable totem poles that grow organically from a large central artery. Upon entering the installation the visitors’ movements trigger the artery to push air into the totems, causing them to rise upwards with a pulsing rhythm. Their anthropomorphic and organic gestalt reminds the viewer of the unity between man and nature. Chico MacMurtrie and Amorphic Robot Works are internationally recognized for large-scale, kinetic installations and interactive public sculpture. MacMurtrie’s recent work, The Robotic Church, is a site-specific installation and performance series in his Red Hook studio, a former Norwegian Seaman’s Church. In conjunction with the special afternoon reception at Pioneer Works, The Robotic Church will be welcoming visitors at 111 Pioneer Street for an immersive site specific installation composed of 35 robotic “sounding” sculptures.